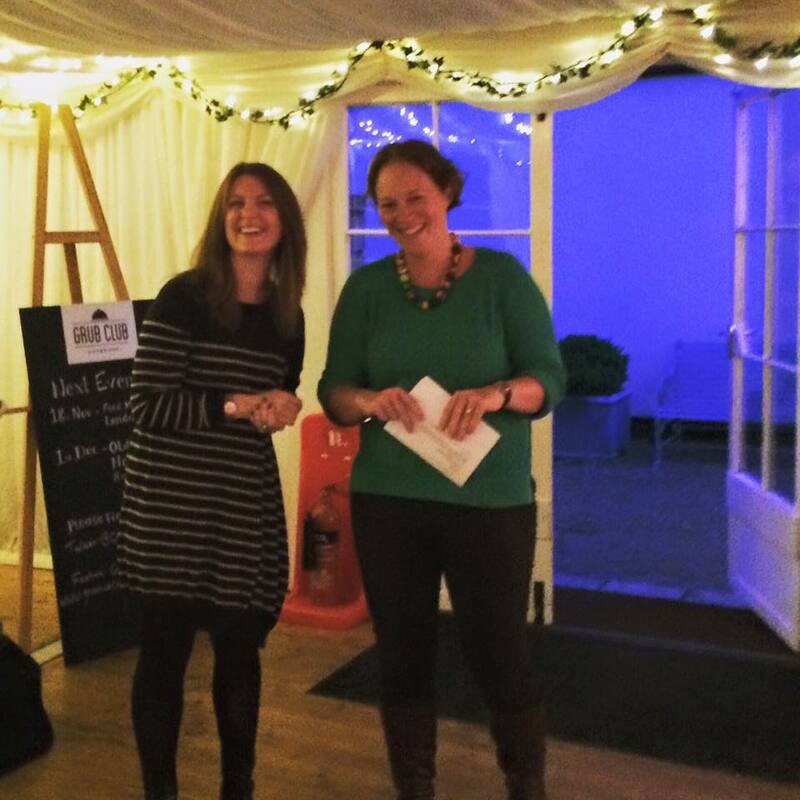 I was fortunate to have attended one of Grub Club Cambridge’s previous events: the Producers’ Dinner at Fitzbillies, which was part of Eat Cambridge 2015. I raved all about it here. 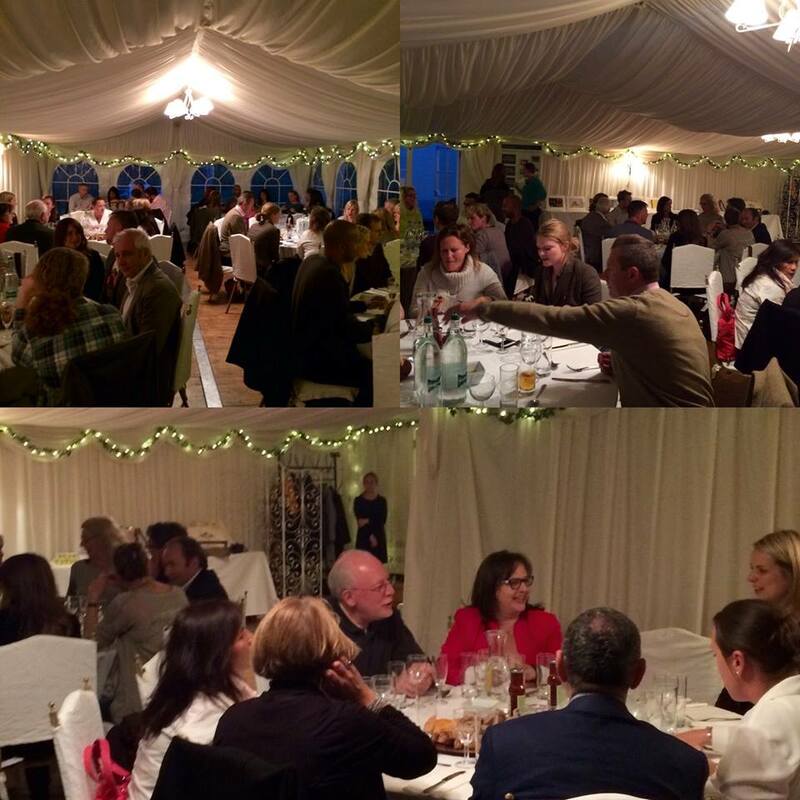 The dinner took place in The Secret Garden marquee at Burwash Manor, a lovely space all decked out with lights and beautifully set tables. There were about 60 people in attendance and I couldn’t possibly mention them all, but if you were there, feel free to share your info and website in the comments below. The Larder is Burwash Manor’s food and drink shop with a staggering variety of delicious items, including Romano’s savoury and sweet delights supplied exclusively for The Larder. Romano’s owner, Paola Davies-Romano, is an expert cook and caterer so it was only fitting that she and her team prepare the menu designed by The Larder, which celebrated everything British. We’re talking bangers and mash, seasonal veggies and Eton Mess. After being given some time to socialise, we found our seats and eagerly awaited the evening’s feast. There were bottles of water on every table as well as a nice variety of fresh bread. Wine was available for purchase. 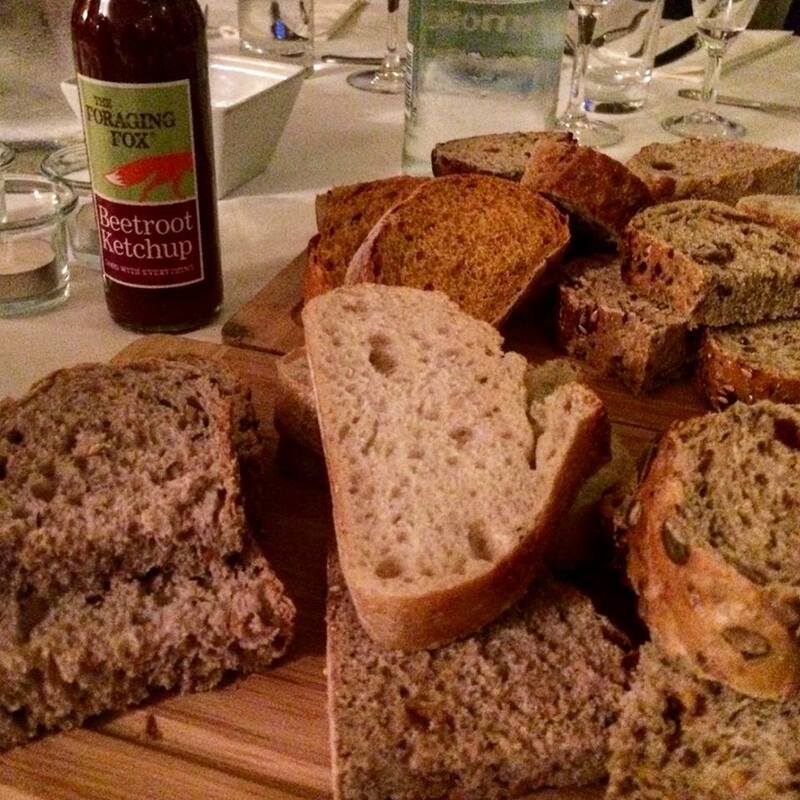 Each table had bottles of beetroot ketchup supplied by The Foraging Fox. Service was impeccable and well-organised. 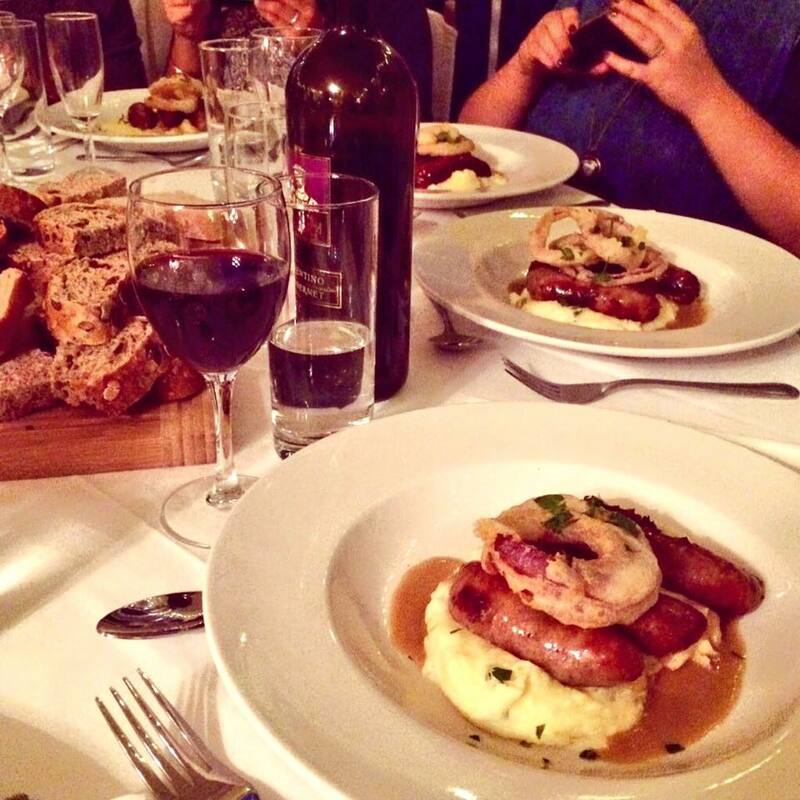 The first traditional British dish was brought out: Bangers & Mash. 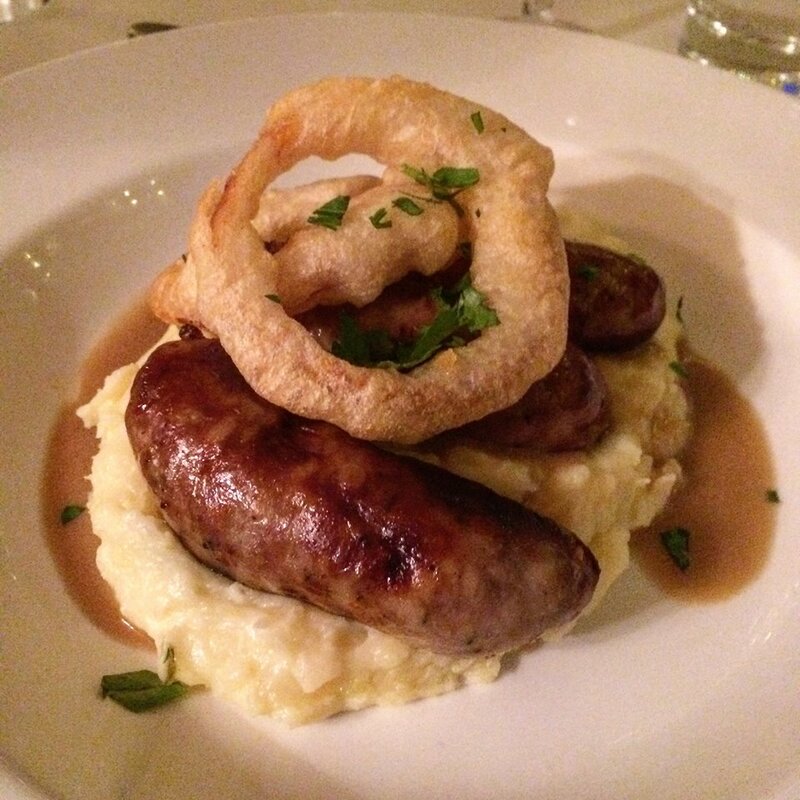 Three of Burwash Manor’s award-winning pork sausages were placed on a bed of creamy mashed potatoes with onions rings on top for a final flourish. The sausages had the perfect balance of meat and fat so they were dense but not dry or greasy. We also enjoyed carrots and green beans with our meal. There was extra gravy on hand but some people tried The Foraging Fox’s beetroot ketchup with the sausages. I dipped my onions rings in the beetroot ketchup. I’m not a big beetroot fan so I wasn’t sure what to expect but I loved it. It wasn’t overly sweet and had a nice combination of beetroot, apple and spices. Very tasty! Dessert was a different take on Eton Mess, with less meringue and more cream. Just one meringue shell on layers of fresh strawberries and cream, garnished with a mint leaf and a white chocolate “straw”. A nice blend of textures and sweet flavours. 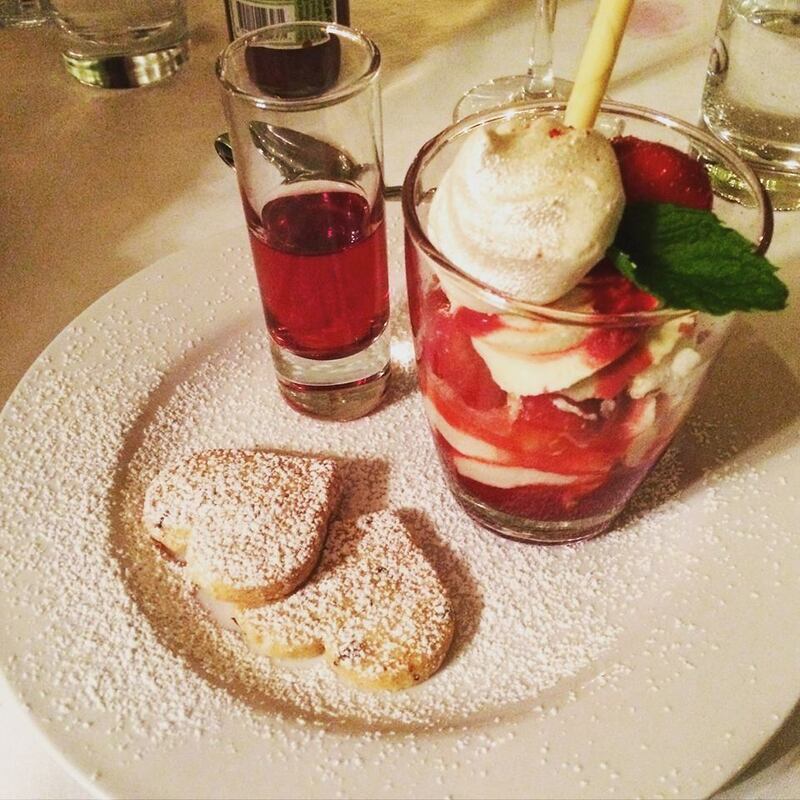 The Eton Mess was served with yummy heart-shaped shortbread biscuits and an earl grey based gin fruit cup made up of apple spirit, blackcurrant, elderflower and bergamot. Very nice presentation! We also enjoyed a talk by the event’s sponsor: award-winning photographer Alistair Grant of Bokeh Photographic, who specialises in food and drink photography. The evening’s topic was “Shouldn’t you be asking your photographer these questions?” and really drove home the fact that great food and drink should look as appetising as it tastes. It’s important for the photographer to understand the psychology of food and how the photo relates to the viewer’s expectations. Food and drink photography is notoriously difficult and of a highly technical nature. However, Alistair remains true to the product and doesn’t use tricks such as motor oil and sprays to make food look better. We had the opportunity to admire some of his work and it is impressive indeed. At the end of the evening, we were given tote bags filled with informative literature, a “Grow your food business with Grub Club Cambridge” packet of seeds as well as some food samples, such as Sweet Preserved Lemon Pickle by Dips’ and Pīrāgi by Ali’s Baltic Bakes (pictured in the photo above by Alistair Grant). The creator of these heavenly “little pies” is Alison Lusis of Ali’s Baltic Bakes. Alison says her Pīrāgi hail from Latvia but all the Baltic countries have their own take on them. She makes hers with a rich yeast dough and they are baked, making them lovely, light and perfectly self-contained. The next day I got to enjoy small samples of Traditional Pīrāgi made with smoked bacon, onion, black pepper and a hint of garlic as well as one with mushroom in sour cream with dill. I can safely say I am hooked on these delicious little pies and I will be seeking out Ali’s Baltic Bakes at various farmers’ markets and events in and around Cambridge. Keep an eye on Alison’s Twitter! It was a pleasure meeting some great people for the first time at the event as well as seeing some familiar faces again, all of which I have become great fans of their products or services. 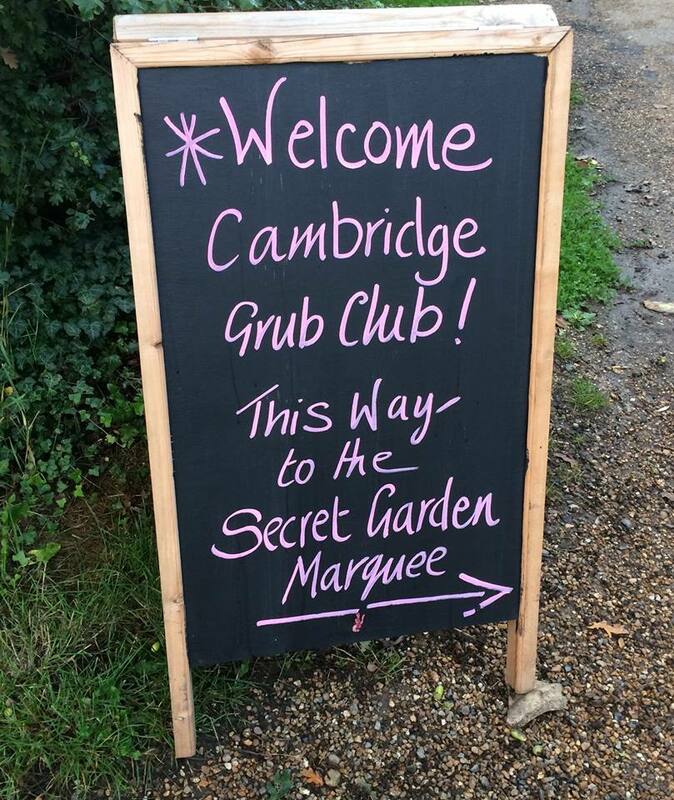 After all, that’s a big part of what Grub Club Cambridge is all about… meeting the faces behind the products and discovering new levels of deliciousness! 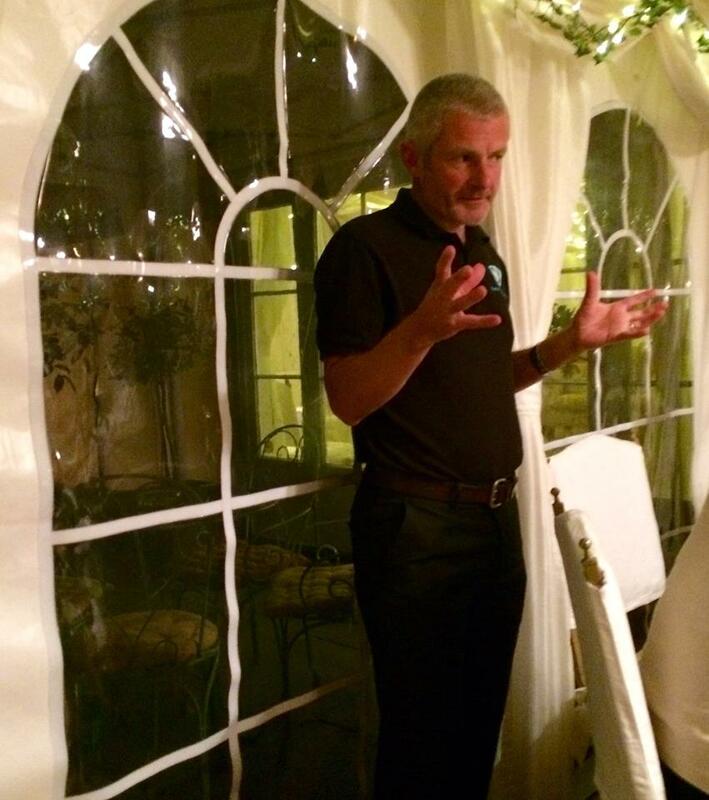 UPDATE: My interview with Grub Club Cambridge was broadcast on Flavour, the food and drink radio programme on Cambridge 105, on 3 October 2015. Please go to my Media page to listen to the interview. Due to last minute cancellations, Grub Club Cambridge were able to invite me to attend the sold out British Food Fortnight at The Larder at Burwash Manor. The food and a glass of fizz were complimentary and I purchased a bottle of wine with some members of my table. Grub Club Cambridge, The Larder and Romano’s were unaware that my experience would be the basis of a written review. It is based on my own experience and I did not receive compensation for my review. This entry was posted in Food Events and tagged Ali's Baltic Bakes, Alison Lusis, Alistair Grant, bangers, Barton, beetroot ketchup, Bokeh Photographic, British Food Forthnight, Burwash Manor, Cambridge, Cambridgeshire, Dips', Eton Mess, fruit cup, Grub Club Cambridge, Kelly Molson, Love British Food, mash, mashed potatoes, onion rings, Paola Davies-Romano, pork sausages, Pīrāgi, Romano's, Rubber Cheese, The Food Marketing Expert, The Foraging Fox, The Larder at Burwash Manor, The Secret Garden marquee, Vhari Russell by One Two Culinary Stew. Bookmark the permalink.